There are many keys to having a successful chapter 13 bankruptcy case. Most importantly, a successful case is one where the debtor has the financial ability to reorganize, the determination to see it through and the ability to satisfy the many requirements of the bankruptcy code. One main factor that I found to be a key to success in a chapter 13 bankruptcy case is to get off to a good start. This includes hiring the right attorney, providing the most detailed information to your attorney, having a petition and plan prepared and filed and following the advice of your attorney. It is also extremely important to get off to a good start with your trustee. This all starts with providing the proper documentation. Approximately 4 to 6 weeks after filing a chapter 13 bankruptcy case, the debtor must appear before the trustee at a 341 meeting of creditors. The purpose of the creditors meeting in a chapter 13 is basically to give the trustee an opportunity to examine the debtor and to determine whether the information is true and accurate and to get clarification with regard to the income, expenses, assets and liabilities of the debtor. To assist the trustee in his duties, the bankruptcy code has mandated that a debtor provide 60 days’ worth of pay advices immediately preceding the filing of the case as well as the most recent four years of federal tax returns. These items must be provided to the chapter 13 trustee at least seven days before the 341 meeting of creditors. If the documents are not provided, the trustee is not able to hold the meeting and examine the debtor. Oftentimes, the trustee will give a second date, known as a continued date, sometime out in the future. If the debtor still has not provided the proper documentatio n, then the trustee will not hold the meeting and will quickly bring a motion to dismiss the case for failure to provide documentation. Each trustee is different in terms of how they would like to receive those pay advices and tax returns. This article is going to provide the submission method set out by Glenn Stearns, Trustee in the Northern District of Illinois. Glenn Stearns handles all of the collar counties surrounding Chicago which is Cook County. 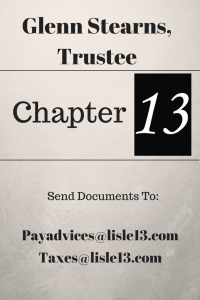 Thus, if you are a debtor who resides in Lake County, Will County, DuPage County, Kendall County, and several other counties, then you will draw Glenn Sterns as your chapter 13 trustee. Glenn Stearns is a very knowledgeable and hands on trustee. He is active not only in the meeting of creditors, but also in court appearances, confirmation issues and just about any other issue involving the case. He does like the pay advices and tax returns sent to his office in a very specific way. If you are sending pay advices to his office, he would like the pay advices to be emailed only to pay [email protected] The subject line must include only the case number. For example 15 – 00123 would be how he would like the subject line to read. He does not want any additional correspondence submitted with the email since the email is not going to be read by a human. Instead, he uses an automated system which will just indicate that the items were in fact received. If you are sending tax returns to his office, he would like those to be sent by email only. The email should be sent to [email protected] The subject line must only read the case number once again. Importantly, the trustee will not accept faxes for either pay advices or tax returns. If the trustee needs additional information, his office will contact you. As you can see, there are very specific methods for which to transmit the required information to the trustee. Each trustee is different. Each trustee wants it a different way. You as a debtor or a bankruptcy attorney have to understand and comply with the trustee’s delivery methods. If you have the right documentation and you submit it to the trustee in a timely manner, then you will be on your way to having a successful chapter 13 bankruptcy case.